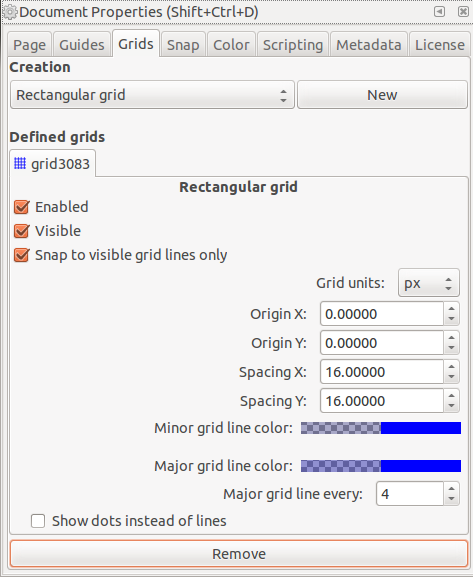 How do I set up snap to grid in Inkscape? I have a grid enabled but snapping doesn't seem to be working. This answer pointed me in the right direction but still didn't solve my problem. I am sharing what I learned about snapping to grids in my answer below. 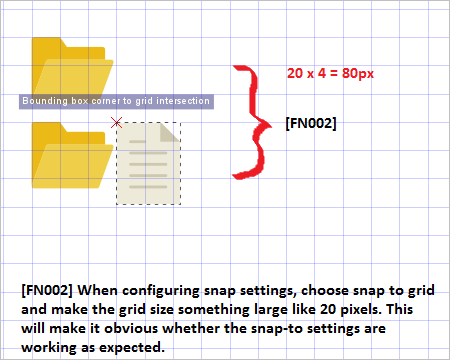 There are several locations in the settings that affect snapping to a grid. We will look at each of these. The images may look different for different operating systems, but the general settings should still be the same. This does not directly affect snapping to the grid, but if you can't see the grid at all, then make sure that the menu item View > Page Grid is checked. The shortcut key is #. To get here, go to File > Document Properties... and click on the Grid tab. You can create a new grid by pressing New if necessary. 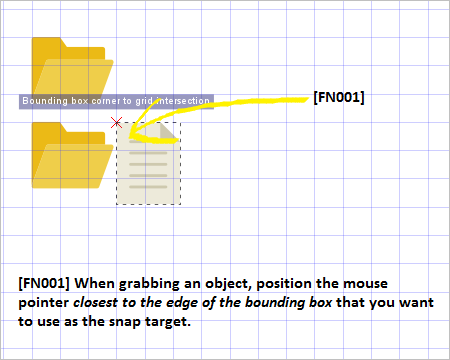 Make sure that it is enabled and that you are snapping to visible grid lines for now. 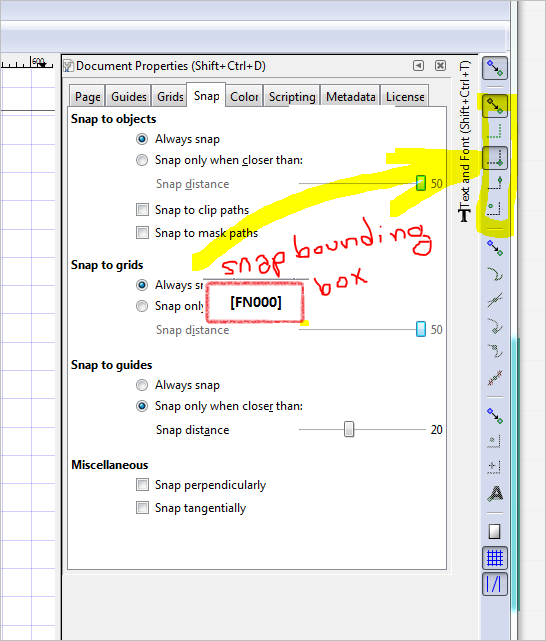 The next tab over in Document Properties is Snap. Choose Always Snap in the Snap to Grids section for now. You can always refine this setting later. If you don't see this toolbar try going to View > Show/Hide > Snap Controls Bar. It looks something like this, though it may be a vertical bar in your setup. For starters try making the same settings as shown in the image. Depending on what you want to snap, these settings could very well be why it isn't working for you. Read more about them if you need to. To get here got to Edit > Preferences > Behavior > Snapping. If you need to you can adjust these, but if not then just use the settings shown in the image. I didn't have the 10th button active in my case. Activating that button got the snapping-to-grid working for me. Set up your grid via File → Document Properties → Grid and File → Document Properties → Snap as Suragch suggested. 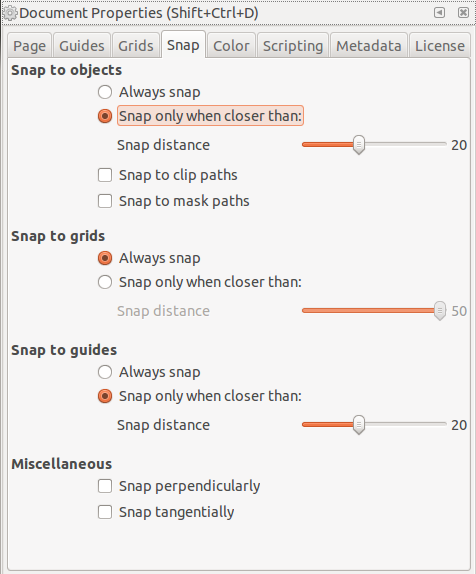 Or go to Inkscape preferences → Snapping and Inkscape preferences → Grid to affect all documents you edit. On my Inkscape, the grid spacing was set to 1px which is not going to be helpful, so increase it to something sensible. When you want to snap something, hold down the Alt key when dragging the mouse. 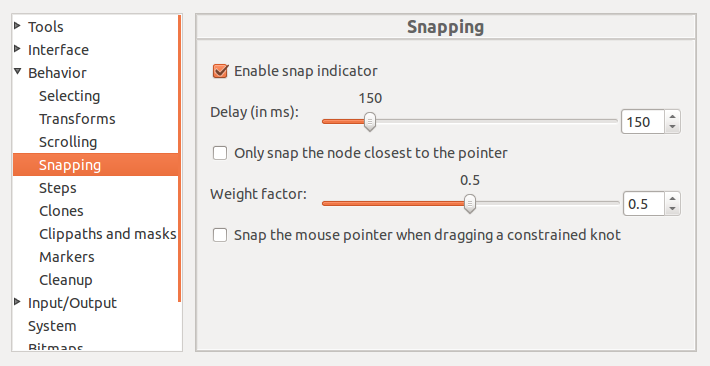 Scenario: UserCelibra wants to use snap-to in inkscape, but it does not appear to be working reliably. Not the answer you're looking for? Browse other questions tagged inkscape grids snapping or ask your own question. How do I draw pixel-perfect symmetrical elliptical shapes in Inkscape?